I’m sure you’ve heard this term thrown around loosely in many war movies. But unfortunately, PTSD is a reality, it doesn’t merely affect combat veterans, it affects millions of people around the world. But remember it also has an effect on their loved ones. And also remember, weighted blankets can help, but we’ll talk about that later. I’m going to take a look at this condition and what you can do to help yourself or someone you know who may suffer from it. 5 What is the Life of Someone Suffering From PTSD Like? Post-Traumatic Stress Disorder is an anxiety disorder that affects your mental ability and state of mind. It is characterized by the inability to recover after experiencing or witnessing a traumatic, life-threatening or frightening event. Symptoms often occur weeks to months after such an event has ended and can intensify as a person struggles to adapt to everyday life again. War veterans often suffer from PTSD, and even people from third world countries who are often exposed to violence are disposed to its symptoms without even knowing it. I’ve heard experts say that people who immigrate to the first world from third world countries with high crime rates have moderate symptoms of PTSD1 and may take a long time to acclimatize in a safer environment. It’s amazing how the mind works. Anxiety, or panic attacks can be triggered due to flashbacks of the traumatizing event. This will often happen during the night when you sleep or when you hear load sounds, bangs or get alarmed suddenly by mistake. It’s important to know that PTSD affects everyone individually, and symptoms can therefore also affect you in different ways. People who have PTSD can suffer from sleeplessness, regular flashbacks of the event can occur, and you can have an array of emotions that seem out of place to people without PTSD. Because of that, people with PTSD can lose confidence in themselves and feel like they don’t fit in anymore. Some people have also experienced temporary amnesia of the event that caused the PTSD, as well as intense feelings of shame or guilt. To most people affected by PTSD, the feeling of helplessness, and not being in control of their thoughts and surroundings is what hurts them most. The use of a weighted blanket in these situations can help you feel more in control as the weight calms your nerves and reduces the production of stress hormones. Having mentioned that, there is no real formula to calculate these feelings, or how you would experience your symptoms. Your moods can be sporadic or sometimes all at once. Mostly you’ll feel lost, like the people around you don’t understand and you can feel as though your life will never be the way it was before. But trust me you will get better, and by using a weighted blanket it can help you make sense of your surroundings by providing a feeling of comfort, control and security. A lot of people also explain a feeling that they don’t belong in society or there is no place for them in the world anymore, feelings of anger or anxiousness are often experienced due to that. Extreme stress, being emotionally sensitive and the dislike of physical contact with other people can be a consequence too. Luckily, a heavy blanket can help for in those cases as it aids in calming and destressing your body. This type of weighted therapy allows for the release of endorphins that soothe and relax you, helping you to manage your environment. The added pressure simulates being touched but it’s not being done by another person, so if you suffer from PTSD you could be more comfortable that way. Using a heavy blanket restores sleep and supports a balanced mood as well, so it really is a great low-cost way of having your own bit of therapy in the comfort of your home. Like I said, PTSD is not an exact science as we have to do with the brain here. Symptoms can start and stop for years after the event has occurred, sending you into a viscous anxious spiral of self-doubt, not knowing when another episode will ensue. It’s vital to know what you’re dealing with, so I’ve compiled a short list of the key symptoms to be aware of to help diagnose this disorder. Inclusion and social isolation – avoiding leaving your home, spending time with friends and family or any possible situation that may remind you of the traumatic event. Flashbacks or recollections of the event over and over especially while you sleep. Negativity – becoming extremely demure and down in your mood, or having more unhappy thoughts and emotions than you usually do. Developing nervous behavior such as irritability, aggression, anxiousness, fear of danger and leaving your home. Even turning to reckless activities like excessive drinking, dangerous sports, using drugs or smoking can be a symptom. Any action or emotion that is an extreme or completely out of the ordinary to you can be a sign that you may have PTSD in cases where you experienced or witnessed a traumatic event. But I’ll add more information about this as we go. As I’ve established, anyone can be affected by PTSD. Unfortunately, there are many causes for PTSD from being in a physically or emotionally abusive relationship, being neglected as a child, witnessing a traumatic event, participating in combat, being exposed to violence, being attacked or assaulted, and so on. Pretty much anything that upsets you in such a way that it affects your ability to function on a level that is normal to you, can be a catalyst for PTSD. I can carry on about the causes, but I think you get the picture. I will say that some people are more prone to getting PTSD after such an experience due to age and gender, and it will also greatly depend on how or where you were raised. Symptoms can also be intermittent. You can have symptoms regularly, then they can disappear for a while and return again at a later stage due to the fact that we all handle stress and trauma differently. Naturally, PTSD must be diagnosed by a medical professional before it can be treated. Specifically, Selective Serotonin Reuptake Inhibitor (SSRI) and sometimes antidepressants and sleep aids. Eye movement desensitizing and processing. These treatments focus on improving symptoms, teaching coping skills, and restoring self-image. The use of a heavy blanket will encompass the 3-in-1 benefits of sleep, weighted and anti-anxiety therapies. What is the Life of Someone Suffering From PTSD Like? If you had PTSD your day would be quite different from everyone else’s. It could be a little bit like a roller coaster ride. You might become socially withdrawn, unable to get out of bed to actually face the day and you may even develop some depression symptoms. Your moods will run either very high or very low, there is not consistent or in-between. This can affect your social, familial and intimate relationships. But these symptoms should dissipate with the correct treatment though. A day in the life of someone with PTSD will consist of many nights filled with nightmares and a restless, interrupted sleep. Waking up wishing you were somewhere else that made you feel more normal. You would have thoughts questioning your ability to have a normal relationship, or feeling like no-one loves or cares about you, and these will often occur throughout the day. What people may think of you after you are diagnosed with PTSD will also concern you. You can become forgetful, so it would very common to walk into a room and walk right out again asking yourself why you went in there in the first place. Thinking that people are staring at you or judging you for no apparent reason is a constant concern for you. Doubts that you have no control over your life and where you will end up one day is a daunting yet constant thought. But allowing yourself regular opportunities to relax in a comfort zone such as your bed or couch with a heavy blanket or lap pad will certainly improve your mood, help you sleep and relieve the feelings of stress and nervousness. Now, if you suspect that you or a loved one may be suffering from PTSD consult your Physician or an Occupational Therapist. Don’t leave your condition undiagnosed and untreated. 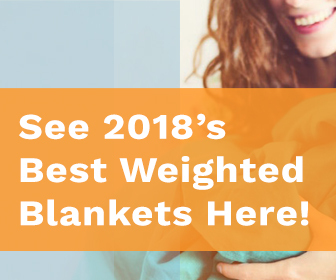 Help your friends and family learn about the amazing benefits of weighted blankets! What are Weighted Shoulder Wraps? What are their Healing Benefits? What’s the Best Fabric for Weighted Blankets? Tactile Defensiveness: How Can Deep Touch Pressure Help? Why Do Weighted Blankets Cost so Much? What Influences their Price? Gentle Weight is a participant in the Amazon Services LLC Associates Program, an affiliate advertising program designed to provide a means for sites to earn advertising fees by advertising and linking to Amazon.com, Amazon.co.uk, Amazon.ca, Amazon.com.au and other Amazon stores worldwide. Gentle Weight is also part of the ShareASale affiliate network. Gentle Weight earns advertising fees by advertising and linking to Shareasale.com. While we try to provide useful information on Gentleweight.com about weighted products we are NOT health professionals! All the information on Gentleweight.com is not intended or implied to be a substitute for advice or treatment from qualified healthcare specialists. If you are experiencing a health condition you should speak to a qualified healthcare professional in the first instance. All the content on this site is for the purposes of general information only. Read full medical disclaimer here.